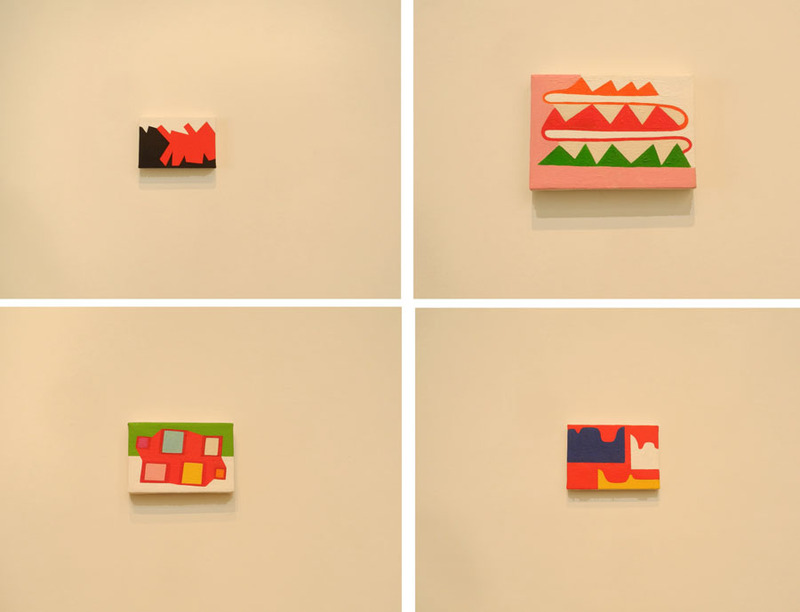 Andrew Masullo, four small paintings, approximately postcard size or a little larger. Last week I saw two shows of abstract painting––Andrew Masullo at Mary Boone, and Painting Advanced at Edward Thorp––that got me thinking about how important the quality of paint was to me: paint itself, how it looks, how it works, how each artist uses it. Andrew Masullo has a marvelous visual imagination; his paintings have seemingly endless combinations of shapes, organic and geometric, surprising and inventive. 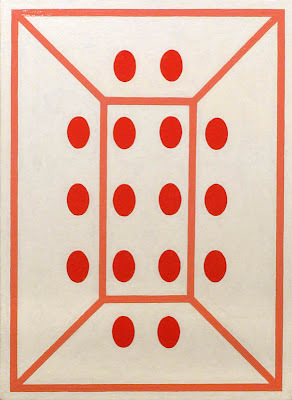 His color tends toward the bright and cheerful, and looking at the work is a happy experience. Andrew Masullo, oil on canvas. 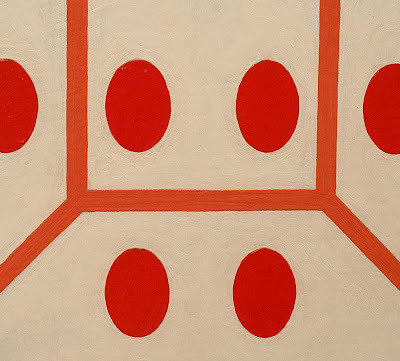 But....I just don't like the way Masullo works with paint. The surfaces are fairly glossy, whether from varnish or the paint medium, and I find that a little off putting. As you can see in the photo above, of a very small painting, the paint is built up in places, but often having nothing to do with the form, because he sometimes works for a long time on a painting. 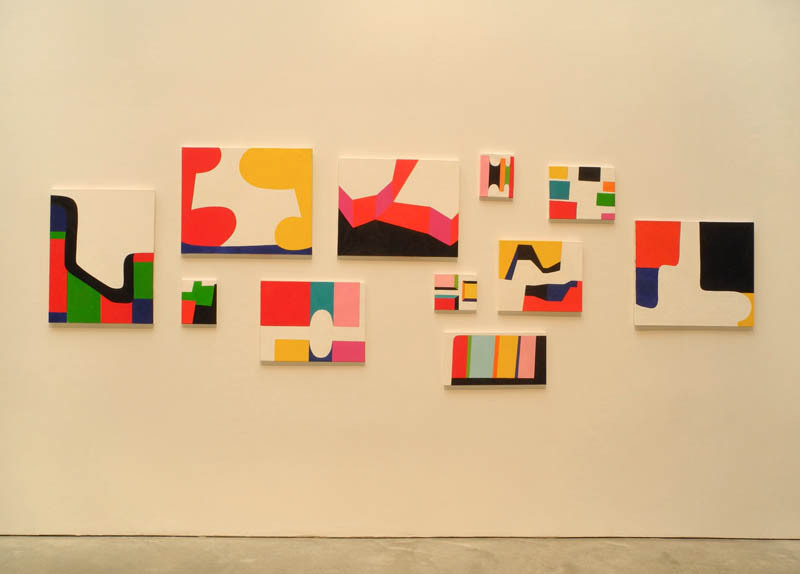 I don't get the sense when I look at these works that there is care taken with facture, with the actual handling of the paint; paint is simply a tool to get at color and shape, to make an image. The images are enchanting, but for me the love of paint is missing. 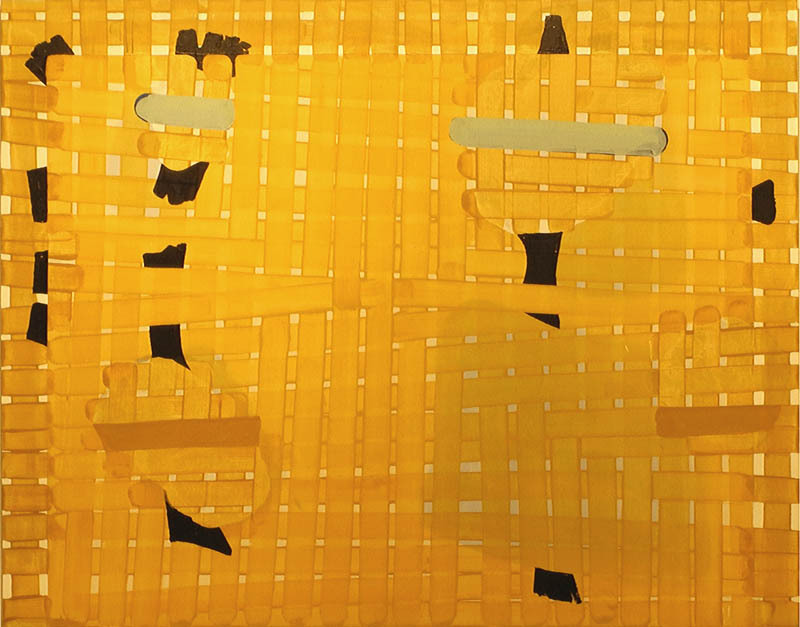 Gary Stephan, Rickety Fields, 2012; oil on canvas, 56 x 70 in. I was very happy to then walk into Edward Thorp Gallery (you can see all the work in the show on the gallery website), with its strong show of five abstract painters, each with a very different approach to image and materials, each with a rich and sensuous use of paint. 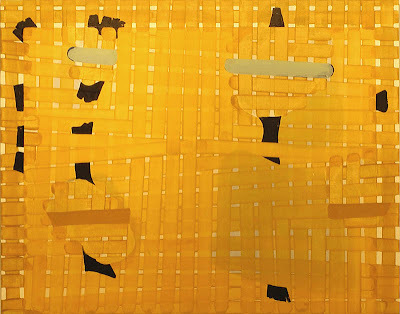 Gary Stephan's overlapping broad strokes create a golden field, broken by odd forms. 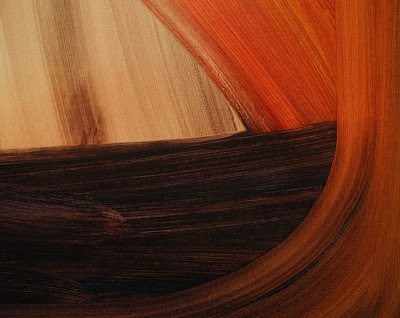 The crisscrossed brushstrokes create subtle color shifts and paint builds at their edges to create slightly darker lines. The mark making itself becomes form. 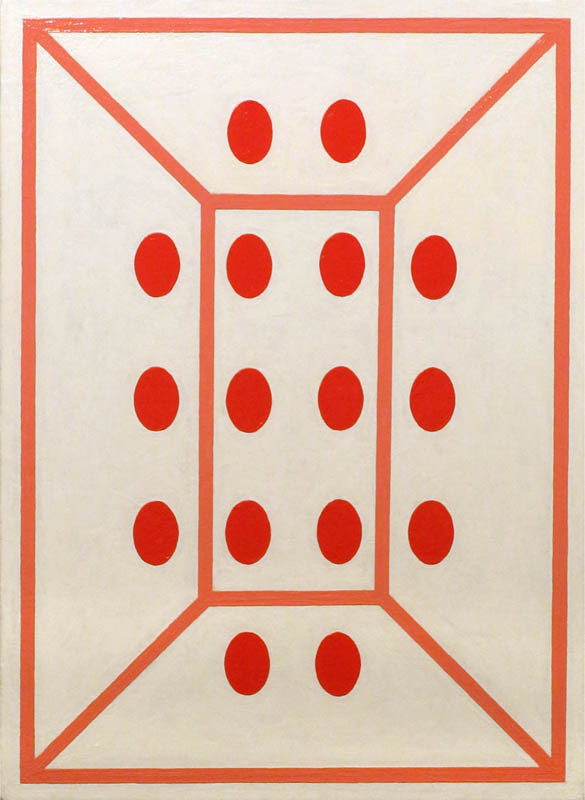 Andrew Spence, Red Pink White 3, 2011; oil on canvas, 22 x 16 in. 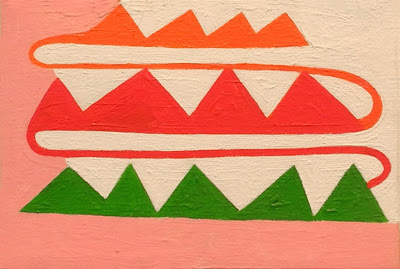 Andrew Spence is a very different kind of painter, a minimalist with a luscious twist of color––pinks and reds and white––and clearly delineated yet ambiguous spaces. 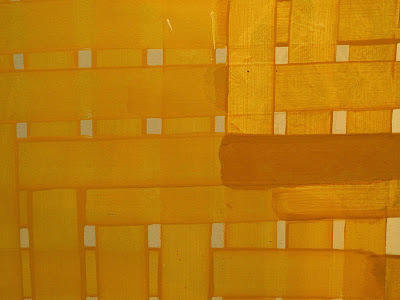 His paint is carefully added so that each shape, each field, is a delicious layering. Andrea Belag, Stage Fright, 2011; oil on linen, 38 x 45 in. In Andrea Belag's work we have paint as drama: broad strokes of large brushes create the form; mark and shape are inseparable. A vivid quality of light is embedded within the translucent strokes. 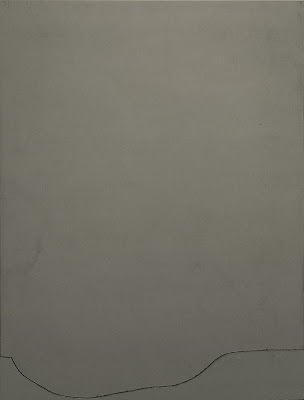 This is a beautiful painting, with a subtly worked surface that does not show at all in photos. Jim Lee uses some unusual materials, all with careful attention. 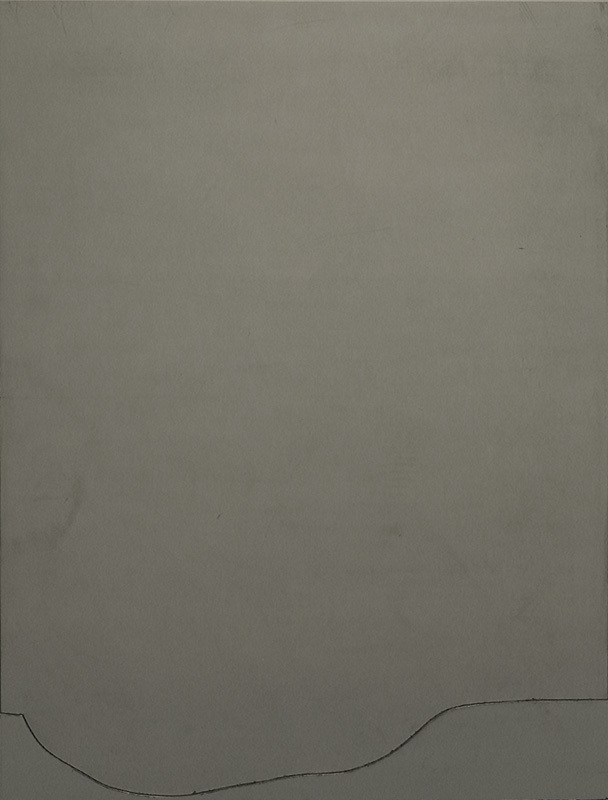 The painting is called "departed" because there is a slight relief at the bottom curve. 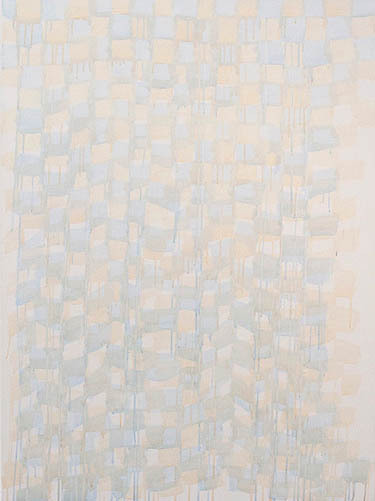 Rachel Malin, B O B, 2012; acrylic, ink on canvas, 54 x 40 in. 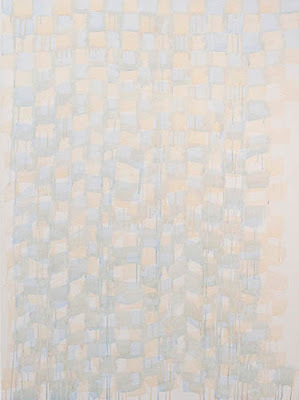 This painting by Rachel Malin has a ethereal quality, as of forms just out of sight, melting away. 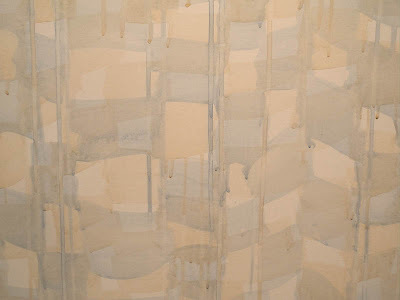 The thin layers of paint drip downward, the quality of thin paint adding to the image, working as line around shape. 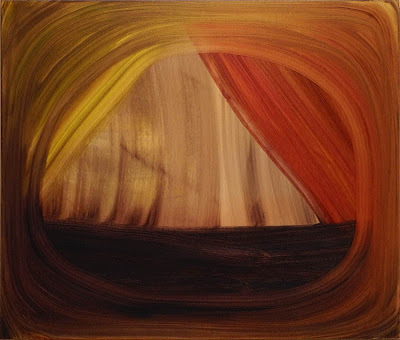 Paint is the essential building block for painters, the DNA, the primal mud from which we rise. The paint makes the image, the paint makes the form, the light, the space; we have to love the paint. Reading your response to these words makes me want to see the Thorpe show. I'll stop by on Saturday. Insightful and provocative. As is usually the case, I'm with you. Interesting take on the subject of paint handling. I like Belag's and Malin's work too. That's a fascinating thought: to love the paint. Which is why, perhaps, online images or those in books can never quite capture the magical quality of paintings. No? For me, seeing the texture of F. Auerbach's faces was incredible. Thanks for responding to this post, Deborah, M.K., and billoo. I'm glad it resonated with you. Wonderful post. I'm happy I saw both of these shows; but I agree with all that you say about the Masullo work. The group shaw at Thorpe gallery was stellar! Thanks, Ravenna, nice to have your confirmation. Altoon, don't know if you saw this but thought you might like it. Thanks for the link, billoo. A New Textile: "Four Diamonds"
A New Textile: "Red/Yellow Ground"